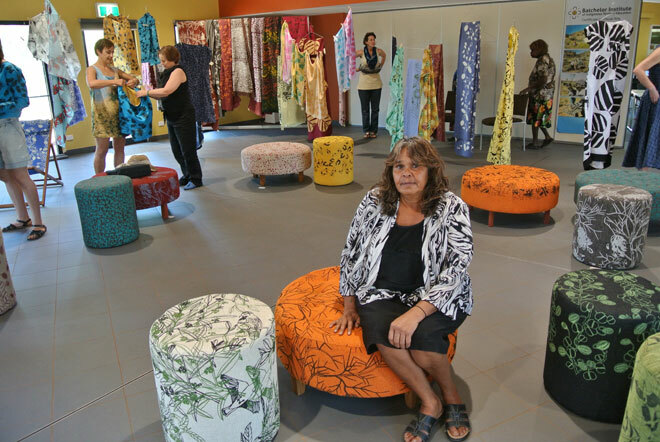 Above: Kathy Inkamala with two of her ottoman designs at Batchelor Institute yesterday. Running their own textile design business moved a step closer this year for print-makers Kathy Inkamala and Lavinia Richards. 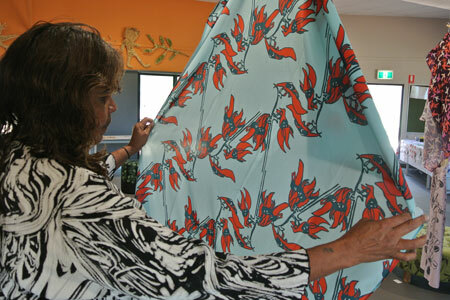 At Batchelor Institute’s visual art studio they have continued to produce their outstanding screenprints, applied to high quality fabric lengths (selling for $45/metre) and – their big drawcard – professionally upholstered ottomans (at $440 to $660 each). But they have also learned how to develop their designs as digital prints, allowing them to move towards larger scale production. With promotion and sales via the internet, they could manage the business independently. 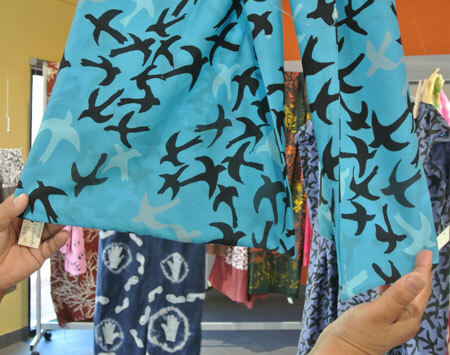 “Digital printing is the easiest way to do it, using the computer” says Kathy Inkamala. Next year the two women and fellow students will learn more about photography, website management and sales, while continuing with their product development. This is focussed in part on finding different ways of reproducing the same design – another way of maximising the return from it. 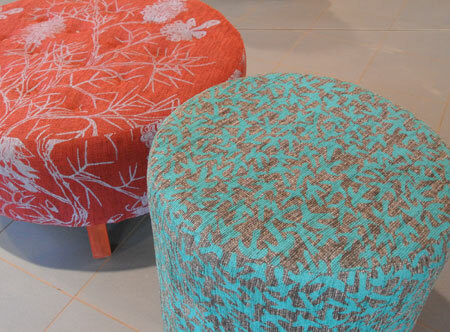 Inkamala’s corkwood design, for example, has been applied to upholstery, dress-making fabric and glass. 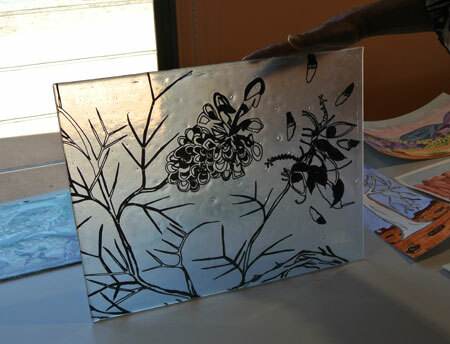 Screen-printing onto glass the first time “freaked me out”, she says, but she was pleased with the result: a second sheet of glass was placed over the printed sheet, then they were fused together in a kiln. It could be used as a platter or, as she demonstrated by holding it up to the light (see below), a window decoration. Richards similarly has thoroughly explored the possibilities of her crow design. “I’m a South Aussie, that why I chose the crow – they call us ‘crow-eaters’,” she laughs. She began with the crow in a landscape, with the birds all around a big gum tree, but it was “too much”. She took the tree away and stayed just with the birds, producing an intricate repeat print. The first application was black crows on a blue background. She took her cues from nature – the colours of a sunset for one design, of the sea for another, applying these to scarves in crepe de chine. For the upholstery though she went with bold contrast, a deep turquoise on charcoal, producing an optical shimmer to great effect. Stewart is confident of demand. In just a couple of hours yesterday, following the opening of the end of year visual art show, eight scarves at $66 each had been sold, with orders placed for six more. By the end of the day, 11 ottomans had sold. The show, next to the café at the Desert People’s Centre, continues today and tomorrow, 9-5pm, and Saturday, 10am-12pm. Wonderful Art … You Go, Girl.